In a statement, AMEX said Australian card members who use an eligible AMEX card with Apple Pay will receive real-time notifications as well as be able to view details of all recent purchases on their card. The AMEX mobile app will also be directly available from the Wallet app, and consumers with membership rewards points will also be able to pay for recent purchases in the mobile app. 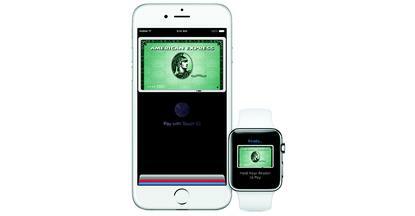 Jennifer Bailey, Apple’s vice-president in charge of Apple Pay, told the Associated Press that American Express cards are easiest to support at launch because AmEx is both the payment network operator and the card issuer, whereas other payment networks like Visa and MasterCard work with financial institutions to issue cards that work on their network. It’s unclear when other cards will be supported in Canada and Australia. “The introduction and rapid adoption of contactless technology has helped satisfy shoppers’ desire for speed and convenience as well as simplified the payment process for businesses,” said AMEX VP global merchant services for A/NZ, Emily Roberts. Not to be beaten by Apple’s announcement, the Commonwealth Bank also announced today that it had expanded the capabilities of its digital mobile wallet offering, Tap & Pay, to support MasterCard and AMEX credit card payments. This means customers can now make purchases using the app on all Android handsets with NFC (near-field communication) capabilities, as well as the CommBank PayTag solution for iPhone users. The banking group claimed more than 300,000 cards have been set up on the CommBank app and one million transactions processed since Tap & Pay was launched. CommBank executive GM for retail products and strategy, Angus Sullivan, also noted Australia has some of the highest volumes of contactless payments globally. “With more than 2.8 million users of the CommBank app each week, we are focused on delivering innovative payment features to our customers,” he said. With additional reporting by Caitlin McGarry.